Ideally located on the beach and within four minutes walk of the centre of Albufeira. 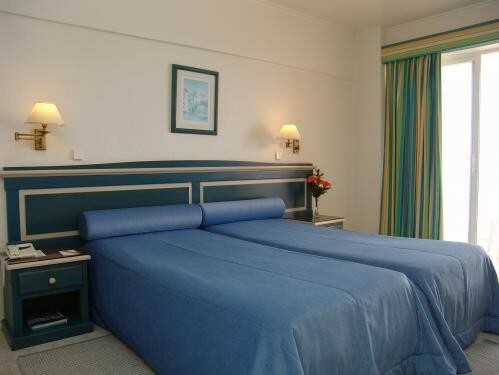 The hotel has 74 comfortable spacious bedrooms. Restaurant, games room, library and indoor swimming pool. Discount rates online. The Hotel Sol e Mar with 74 comfortable spacious bedrooms is part of the Fernando Barata Group of Hotels. 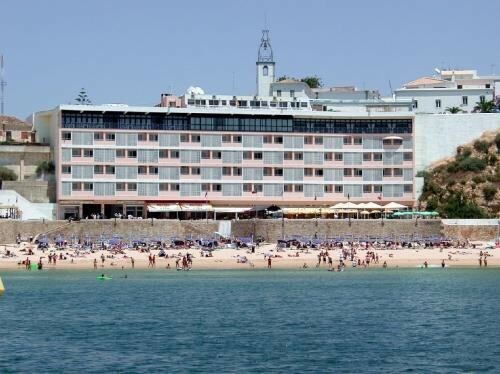 It is one of the oldest hotels in Albufeira in the Algarve and therefore has a commanding position on the beach whilst also being within easy walking distance of the centre of the old town. The hotel enjoys a 4-star rating and is internationally popular because of its location, personal touch and elegant style. Faro Airport 30km - Taxi service: EUR 35. Offering a balcony with views of the Atlantic Ocean, this air-conditioned room has a seating area with a cable TV. It includes a private bathroom with a hairdryer.